WATCHING the rough cut of U-Wei Saari’s much-awaited film Hanyut, screened for a selected audience, is an eyeopening experience. As the film progresses, we learn that Sofia is playing Mem Putih, a Malay woman of Betawi origins who is married to Dutch trader Kasper Almayer, played by Australian actor Peter O’Brien. Almayer has just heartlessly separated Mem from their 10year-old daughter Nina, who is being sent to Singapore to attend school there and learn to be a Westerner. The opening scene finally makes sense: the boat Mem is chasing is taking her daughter away and the man who is stopping her is her husband. Mem begins to hate her husband for separating her from their daughter. She becomes a bitter woman and wants to inflict her pain on her husband. Revenge has blinded her to the point that she is even willing to use their daughter to hurt the man she hates. Hanyut, based on Joseph Conrad’s first novel Almayer’s Folly, will open in cinemas here on Nov 24. When U-Wei first came out with the idea of turning this particular novel into a film 15 years ago, he had award-winning Indonesian actress Christine Hakim for the role of Mem in mind. But as time passed and taste changed, U-Wei decided to give Sofia the role instead. Watching the film, one can say that U-Wei has made the right choice because Sofia has nailed the role of a frustrated mother and bitter woman brilliantly. The actress had read the novel years ago. When she was offered the role in Hanyut, she picked up the novel again and explored the role of Mem Putih in more detail. “Conrad’s depiction of Mem Putih had intrigued me,” says the 44-year-old Sofia. “I believe her pervasive rationality is instrumental to the story. Set in the 1800s, we see a cultured and liberal Malay woman. This opened up a whole new set of possibilities for me as an actor and a woman. Sofia enjoyed shooting the scene where her character Mem is finally reunited with her daughter Nina after 10 years. The grown-up Nina is played by Diana Danielle. The scene where the mother and daughter try to find common ground to reconnect after years of being apart is both touching and emotional. Mem’s pain and bitterness of having her child taken away from her has led the actress to go back to a period in her life she had not wanted to revisit. Years ago, Sofia had lost her son. “All those emotions came rushing back once the rehearsal started,” she recalls. In fact, Sofia can also relate to the emotional feelings that her screen daughter Nina goes through in Hanyut. Nina is constantly searching for her identity, whether she is a westerner or a Malay. And like Nina, Sofia comes from a British-and-Malay parentage. 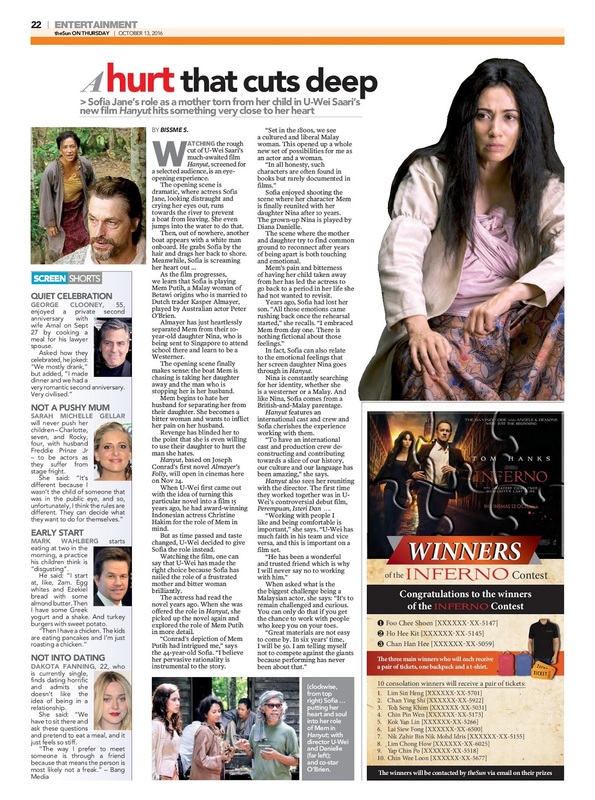 Hanyut features an international cast and crew and Sofia cherishes the experience working with them. “To have an international cast and production crew deconstructing and contributing towards a slice of our history, our culture and our language has been amazing,” she says. Hanyut also sees her reuniting with the director. The first time they worked together was in UWei’s controversial debut film, Perempuan, Isteri Dan …. “Working with people I like and being comfortable is important,” she says.